Packed with protein alongside 20 essential vitamins and minerals, these bars will upgrade your snacking. 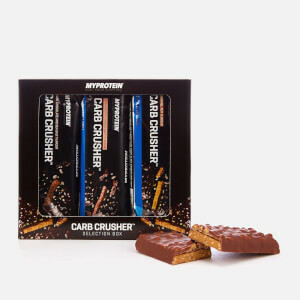 They’re triple-layered, topped with crunchy crispies, and coated in chocolate — perfect for satisfying your sweet tooth and supporting your training regime. 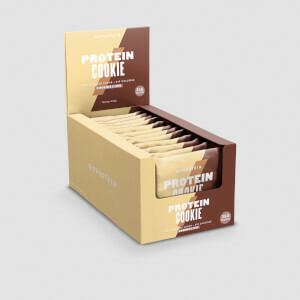 They’re loaded with 21g of protein, helping you hit your daily requirements in a delicious way — helping to grow and maintain important muscle,1 supporting the effort you put in at the gym. By keeping you fit and energised to give your all to training,2,3 these indulgent-tasting bars will push you through even the toughest of workouts. 2. Iron, vitamin B6, B12, C, and zinc contribute to the normal function of the immune system. 3. Iron, vitamin B6, B12, and C contribute to a reduction of tiredness and fatigue. When to enjoy THE Carb Crusher? What to enjoy THE Carb Crusher with? Mix up a shake of THE Whey for a powerful pre- or post-workout boost of ultra-premium protein — it’s the perfect partnership. Warning: Excessive consumption may cause laxative effects. Store in a cool, dry place away from direct sunlight. This product is intended to be used alongside an active lifestyle and a balanced diet. Not suitable for vegetarians. Milk chocolate with fibres and sweeteners 25% (cocoa butter, inulin, oligofructose, cocoa mass, whole milk powder, skimmed milk powder, sweeteners (erythritol, steviol glycosides), emulsifier (soy lecithin), flavours), peanut flavoured paste (bulking agent (polydextrose), cocoa butter, skimmed milk powder, xylitol, flavours, emulsifier (soy lecithin), salt), milk protein, gelatine hydrolysate, humectant (glycerol), soy crisps (soy protein, tapioca starch, salt), soy granules, peanuts 1,7%, sunflower oil, flavours (contains peanut), minerals (tricalcium phosphate, ferric(III)diphosphate, zinc oxide, manganese sulphate, copper sulphate, potassium iodide, sodium selenite), salt, vitamins (vitamin C (ascorbic acid), nicotinamide, vitamin E (tocopheryl acetate), calcium pantothenate, vitamin B2 (riboflavin), vitamin B6 (pyridoxine hydrochloride), vitamin B1 (thiamin hydrochloride), vitamin A (retinyl acetate), folic acid, vitamin D (cholecalciferol), biotin, vitamin B12 (cyanocobalamine)), sweetener (sucralose). Milk chocolate with fibres and sweeteners 25,2% (cocoa butter, inulin, oligofructose, cocoa mass, whole milk powder, skimmed milk powder, sweeteners (erythritol, steviol glycosides), emulsifier (soy lecithin), flavours), caramel flavoured layer 16,8% (bulking agent (polydextrose), cocoa butter, skimmed milk powder, xylitol, flavours, emulsifier (soy lecithin), salt), milk protein, gelatine hydrolysate, humectant (glycerol), soy crisp (soy protein, low fat cocoa, tapioca starch), soy granules, sunflower oil, low fat cocoa, peanuts, flavours, minerals (tricalcium phosphate, ferric(III)diphosphate, zinc oxide, manganese sulphate, copper sulphate, potassium iodide, sodium selenite), salt, vitamins (vitamin C (ascorbic acid), nicotinamide, vitamin E (tocopheryl acetate), calcium pantothenate, vitamin B2 (riboflavin), vitamin B6 (pyridoxine hydrochloride), vitamin B1 (thiamin hydrochloride), vitamin A (retinyl acetate), folic acid, vitamin D (cholecalciferol), biotin, vitamin B12 (cyanocobalamine)), sweetener (sucralose). The Dark Chocolate and Sea Salt bar is great. Perfect taste - not too sweet; no funny aftertaste like some other bars have; good texture - with crunchy bits; fair nutrition numbers. It doesn't taste or feels like a protein bar. The best I ever tried. Personally I would ditch the "caramel" layer - that's the only thing I don't like about this bar. I've tried many, bought lots from Home Bargains stores to taste test and if im honest, nothing comes close to the Cab Crusher. They cost a little more but you do get what you pay for. The texture is spot on, enough chew to feel like its naughty but not enough to give you jaw ache like so many others. Everything, its great snack to have anytime with anything. Love this protein bar, tasty, & works well in my diet and macros, great alternative to a shake if I need some more protein. These are hands down the best protein bars I've ever tasted. Defo recommend getting the sample pack with one of each flavour - they're all really good to be fair but dark choc and sea salt is extra nom. I've had 3 boxes of these now and they're perfect for sweet treat in the afternoon or to top up your macros. This are unbelievably tasty. I've tried all flavours now and the peanut butter flavour is definitely top of the list. Followed by Fudge Brownie, then caramel nut, then Dark Chocolate, then Strawberry Cheesecake. Perfect as an on the go snack at 200 calories and 21g of protein. These are great! The taste really kicks in after a second and they aren’t tough to chew. Just about the same as a toffee crisp. While I’m at work I look forward to going home & having one after dinner, then I have to have another!! First off, these bars taste amazing. I got the chocolate peanut butter flavor and I thought I had found the perfect protein snack bar; great nutrients and it tastes awesome! 5 hours later however as I gripped the walls of my bathroom for dear life as I unleash an army of angry demons into the sewers of England I had a slight change of mind. I should have foreseen it from their name: "Carb Crusher" that they would be packed full of horrific artificial sweeteners that are known to have this effect. I've eaten about 4 of these bars over 2 weeks and it has happened each time so I know it's not my diet doing this. 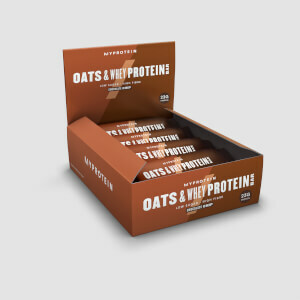 I will still buy from MyProtein but i'm afraid these bars are not for me or anyone who values solid and voluntary bowel movements. Great learning experience though. Very strange taste, I thought I’d cut myself and looked in a mirror to see if my tooth was bleeding! This was because there was a strong metallic taste! Rest assured, my teeth were fine, it was just an over powering metallic taste in the bar! The texture is quite chewy, but no different to over protein bars. Either way, it helped to curb a craving. Just the taste with this unfortunately, which is why it has low stars. They are just not good. Just like the lean protein bars, they have a horrible artificial taste.